Registers and minutes for the Jefferson Literary and Debating Society, the debating society at the University of Virginia of which Woodrow Wilson was a member. Collection consists of scans taken from the society's Roll Book, 1856-1886 and Minute Book, 1875-1895. 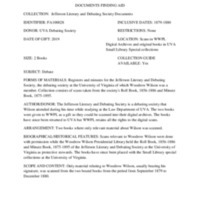 Scans relevant to Woodrow Wilson were done with permission while the Woodrow Wilson Presidential Library held the Roll Book, 1856-1886 and Minute Book, 1875-1895 of the Jefferson Literary and Debating Society at the University of Virginia as protective stewards. The books have since been placed with the Small Library special collections at the University of Virginia. Only material relating to Woodrow Wilson, usually bearing his signature, was scanned from the two bound books from the period from September 1879 to December 1880. Identifier: WWP17244. Jefferson Literary and Debating Society Roll Book: List of members of the Jefferson Society for 1879-1880 and 1880-1881. Identifier: WWP17245. Jefferson Literary and Debating Society Minute Book: Handwritten meeting minutes from the Jefferson Society at the University of Virginia. Identifier: WWP17246. Jefferson Literary and Debating Society Minute Book: Handwritten meeting minutes from the Jefferson Society at the University of Virginia. Identifier: WWP17247. Jefferson Literary and Debating Society Minute Book: Handwritten meeting minutes from the Jefferson Society at the University of Virginia. Identifier: WWP17248. Jefferson Literary and Debating Society Minute Book: Handwritten meeting minutes from the Jefferson Society at the University of Virginia. Identifier: WWP17249. Jefferson Literary and Debating Society Minute Book: Handwritten meeting minutes from the Jefferson Society at the University of Virginia. Identifier: WWP17250. Jefferson Literary and Debating Society Minute Book: Handwritten meeting minutes from the Jefferson Society at the University of Virginia. Identifier: WWP17251. Jefferson Literary and Debating Society Minute Book: Handwritten meeting minutes from the Jefferson Society at the University of Virginia. Identifier: WWP17252. Jefferson Literary and Debating Society Minute Book: Handwritten meeting minutes from the Jefferson Society at the University of Virginia. Identifier: WWP17253. Jefferson Literary and Debating Society Minute Book: Handwritten meeting minutes from the Jefferson Society at the University of Virginia. Identifier: WWP17254. Jefferson Literary and Debating Society Minute Book: Handwritten meeting minutes from the Jefferson Society at the University of Virginia. Identifier: WWP17255. Jefferson Literary and Debating Society Minute Book: Handwritten meeting minutes from the Jefferson Society at the University of Virginia. Identifier: WWP17256. Jefferson Literary and Debating Society Minute Book: Handwritten meeting minutes from the Jefferson Society at the University of Virginia. Identifier: WWP17257. Jefferson Literary and Debating Society Minute Book: Handwritten meeting minutes from the Jefferson Society at the University of Virginia. This excerpt notes the election of officers to the Jefferson Literary and Debating Society and Woodrow Wilson’s wish to introduce changes to its constitution. Identifier: WWP17258. Jefferson Literary and Debating Society Minute Book: Handwritten meeting minutes from the Jefferson Society at the University of Virginia. Identifier: WWP1724459. Jefferson Literary and Debating Society Minute Book: Handwritten meeting minutes from the Jefferson Society at the University of Virginia. Identifier: WWP17260. Jefferson Literary and Debating Society Minute Book: Handwritten meeting minutes from the Jefferson Society at the University of Virginia. Identifier: WWP17261. Jefferson Literary and Debating Society Minute Book: Handwritten meeting minutes from the Jefferson Society at the University of Virginia. Identifier: WWP17262. Jefferson Literary and Debating Society Minute Book: Handwritten meeting minutes from the Jefferson Society at the University of Virginia. Identifier: WWP17263. Jefferson Literary and Debating Society Minute Book: Handwritten meeting minutes from the Jefferson Society at the University of Virginia. Identifier: WWP17264. Jefferson Literary and Debating Society Minute Book: Handwritten meeting minutes from the Jefferson Society at the University of Virginia. Woodrow Wilson reports on changes and revisions being done on the society’s constitution. Identifier: WWP17265. Jefferson Literary and Debating Society Minute Book: Handwritten meeting minutes from the Jefferson Society at the University of Virginia. The minutes note that the society adopted a new preamble and considered various other electoral changes. Identifier: WWP17266. Jefferson Literary and Debating Society Minute Book: Handwritten meeting minutes from the Jefferson Society at the University of Virginia. Identifier: WWP17267. Jefferson Literary and Debating Society Minute Book: Handwritten meeting minutes from the Jefferson Society at the University of Virginia. Mark Edwin Peterson, “Jefferson Literary and Debating Society Documents Finding Aid,” 2019, FA100028, Jefferson Literary and Debating Society Records, Woodrow Wilson Presidential Library & Museum, Staunton, Virginia.